This mid-19th century cruet stand is one of several lots of English silver to be offered by Clarke Auction Gallery in Larchmont, New York, on February 10. 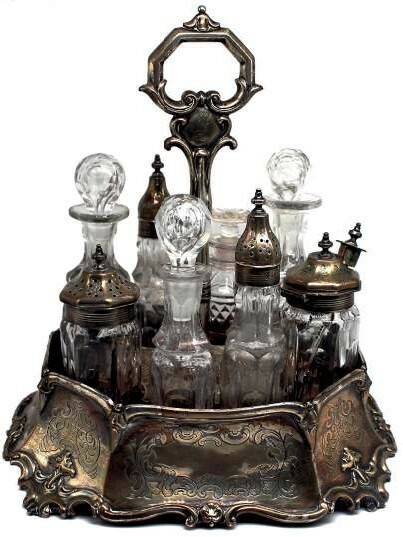 This English mid-19th century cruet stand is estimated at $400-600 at Clarke Auction Gallery on February 10. The stand with 8 glass bottles, four with silver mounts, is marked for John and George Angell with a date letter for 1848, and bears an armorial crest. The auction house says all bar one bottle and stopper appear to be original and the wooden base to the stand is thought to be a replacement. It stands 10¼in (25.5cm) high, comes from a Long Island estate and has an estimate of $400-600. Could market for modern silver designs get a boost as Pearson collection heads to San Francisco?